Hi Mary – popping over from the NQB group. 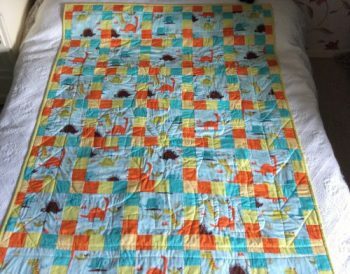 William’s quilt looks so loved – isn’t that the best thing about quilting?! I love your Christmas tree skirt – each year I claim we will have one and each year I end up wrapping some length of fabric around the base. Thanks for the reminder that I need to get this on my list NOW!! Hi Abigail, thank you for visiting my blog it’s such great fun meeting all the new bloggers. Thank you ” what a fun party this is” enjoying every bit of it. Hi! I love how you came up with the name for your blog. It’s always great to have a supportive husband around. Thank you Suzy, yes and he plays golf which makes me feel less guilty about purchasing fabric. Love your tip and the quilts you shared. I’m happy to get to know more about you and the unique way you chose the name for your blog. Happy stitching! Thank you for visiting my blog. Hope you enjoy the rest of the blog hop. One of my favorite quilters, Angela Walters, has several quilting quotes that I try to remember. “Finished is better than perfect.” “If you do something once, it’s a mistake. If you do it twice, it’s a design choice.” Lovely to get to know you better! Hi Yvonne, good to meet you,it has been a great day. Thank you for the support. Cathedral windows is on my to do list too! Looks like Williams quilt will be well loved! Thanks Ruth, I think Cathedral Windows always looks good in blue and white. Hi, Mary! I’m glad I got to learn more about you, especially how you came up with your blog name. Your quilts look awesome and I like the two-sided quilt for William. I think a candlewick quilt would be amazing and I’d love to see that! Hi Sarah , thank you, the two- sided quilt gave me a few problems squaring up, however I got there in the end. Hi, think I may have sent you the wrong message, sorry.Great to meet you hope you enjoy the rest of the blog hop. 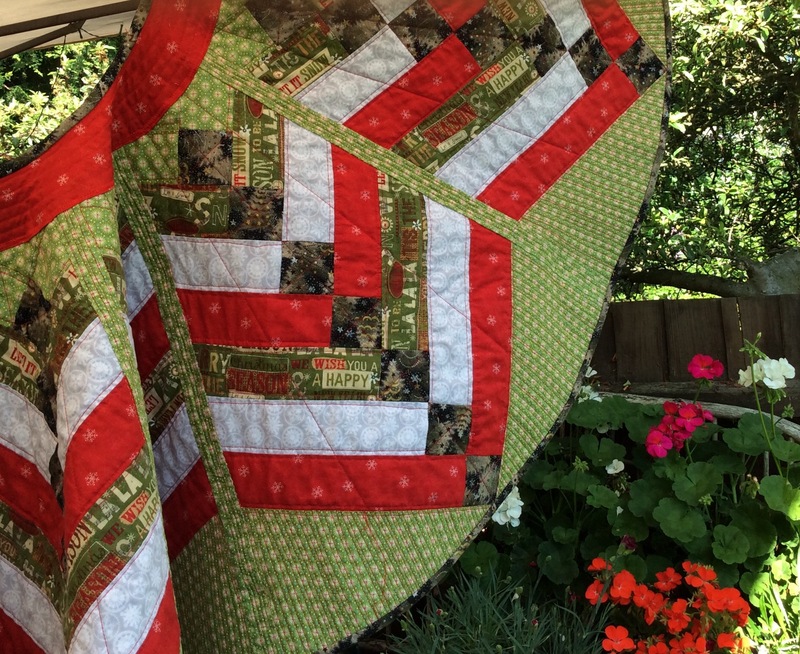 Love the quilts and you have an absolutely beautiful blog!! Hi Amista, Thank you, it is wonderful that we get to share our work with other great quilters. Hope you enjoy the rest of the blog hop. Hello Mary. Thanks for sharing your story with us! I love that 2-sided quilt for William. It is darling! A tree skirt has been on my to-do list for a very long time. Is this the year for it? Probably not, but maybe I’ll be in the mood to at least start one when the holidays start up. Thanks Jen, great to meet you. The quilt was only going to be one -sided but after seeing the animal panel just had to use it! I love your free motion quilting teacher’s advice! I love your Christmas tree skirt. I need to make a new one so I keep looking for inspiration! Hi Stephanie, thank you for the blog loving it has been a great day! Hi Mary!! I loved reading your blog! And the advice from your instructor is priceless. I will definitely have to remember that! Happy Blogging! Thanks for visiting Pamella, hope you have had a lovely day! Great to meet you. Hello Mary! 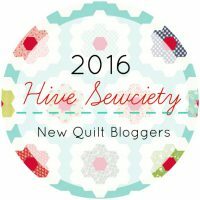 Just popping over from the New Quilters blog group. 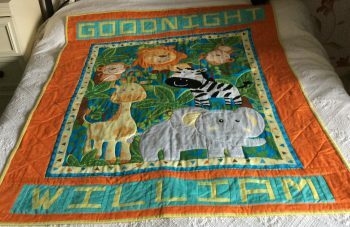 I love your featured quilts, especially William’s because he loves it so. Gotta love anyone who kisses the quilt you give them and immediately puts it to use! I used to embroider a bit and just recently did some embroidery on a new quilt block design. Doing a whole quilt with embroidery someday is definitely on the bucket list! Hi Jennifer, It’s difficult to choose embroidery or quilting! So if I can combine them both , happy days! Great to meet you. Hi,thank you, great to meet you. I’m trying hard to live with imperfection and enjoy the journey that quilting brings. Thanks Sue, There are so many creative people in quilting land to inspire us. It’s difficult to choose what to do next. Hi, So nice to meet you. I think William’s quilt is delightful. I had to check out the link for the alphabet letters as I’ve been looking for some. I use my husband, too, for computer help. Oh, good quilting tip as I’ll be starting my 4th free motion quilt on my domestic machine. Hi and thank you, it’s great to get to know you. Good luck with the quilting. Thanks Alice, I went for quilting around the animals, think it turned out well! Love the quilts you shared today Mary! Now I might need to make a tree skirt as well! Hi Jodie, thanks for visiting, hope you are enjoying the blog hop. Hi Katrin, great to meet you. There are a couple of projects I need to finish first then I can make a start on Cathedral Windows. Thanks Carol, my husband retires next year, it will take a little adjustment. Hope you gain a lot from being part of the 2016 blog hop ☺ I really enjoyed being part of last years hop, learned a lot and found a lovely group of inspiring quilting bloggers to follow. Hi and thank you, I’m really enjoying the hop with such inspiring ladies. Hi Mary, I really enjoyed reading your blog today. I love Williams Quilt, and William himself looks a real sweetie. I enjoyed getting to know you better, and it’s a lovely story about your name. Hi Kate, It has been a wonderful couple of days, thank you . It was fun to meet you and learn about how you came into quilting. I love looking at your quilts, they are very pretty. Thank you Kathy, it has been a busy few days, hope you enjoy the rest of the blog hop. Love William’s quilt. I love to design and make unique quilts for my grandson’s. I hope one day they will make great momentos of their Nana some day. It was great to get to know you a little better. Hi Sharla,thank you, it’s great fun making quilts for the family. Good to meet you! The child’s quilts is wonderful. I like the idea of just go with it in FMQ, that’s my motto. Thank you, it was fun to make and my grandson loved it. William’s quilt is wonderful. Looks like he really loved it. Nice to meet you. Hi, pleased to meet you,hope you are enjoying the blog hop. Hi, I love making things for Christmas and enjoy taking photos. Try designing your own quilt, it’s lot’s of fun. I do it so much I rarely use patterns anymore. Hi and thank you, I will try not to put off designing my own quilt for too long. What fun to meet you! 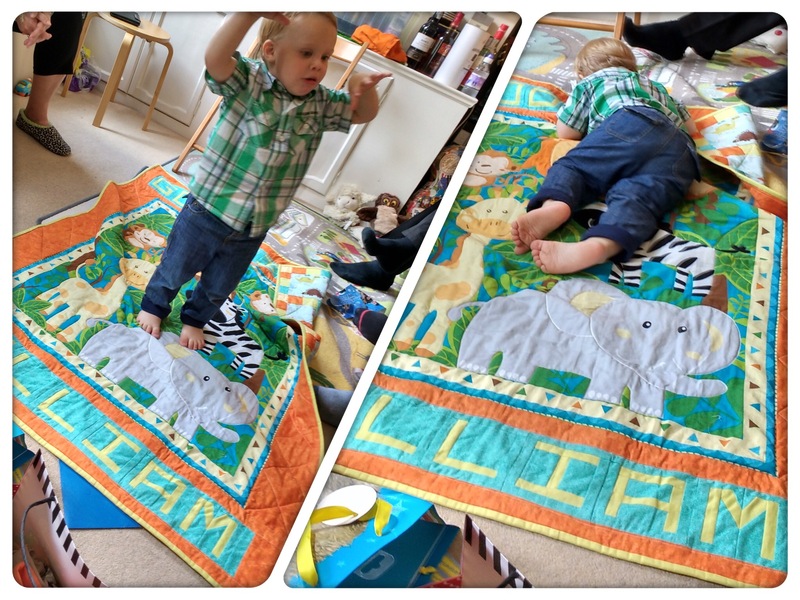 William’s quilt is darling and so is he! Your Christmas tree skirt will be great for many years to come! Thanks for sharing. Thank you, it’s great making quilts for the family. The skirt is something I have been wanting to make for a long time. Mary, I love how you came up with your blog name. It’s so nice to meet you and see some of your work . Beautiful! Thank you Jen, I had a great week, good to meet you! Making a mistake 3 times makes it a pattern — wise words indeed! Nice getting to know you on the hop. Also, I like the clean look of your blog. Hi Diana and thank you. I need to keep things as simple as possible as I get easily confused. Enjoy the rest of the hop!